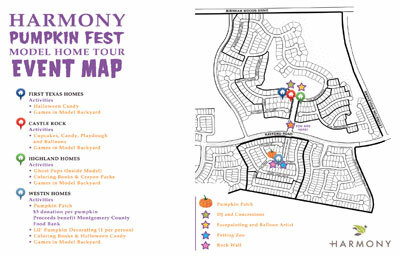 North Houston’s newest community, Harmony, will host a spook-tacular pumpkin patch along with hay rides, a petting zoo and more during its Pumpkin Fest & Tour of Homes, a free event for the entire family on Saturday, October 27 from 11 a.m. – 4 p.m.
Harmony is located near the intersection of Rayford Road and Riley Fuzzell Road, just two miles east of the Hardy Toll Road. Families are encouraged to bring their cameras for that perfect pumpkin patch picture of the kids. Large and medium-sized pumpkins will be for sale for $5 with proceeds benefiting the Montgomery Food Bank. Plus, small pumpkins will be available for the kids to decorate. Face painting, balloon art, a rockwall, field day games and an inflatable bouncy house are expected to add to the fun. 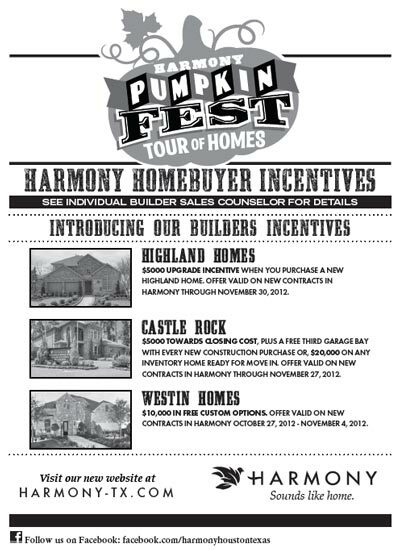 Families also can enjoy trick-or-treat fun as they tour Harmony’s magnificent model homes from Highland Homes, Westin Homes, First Texas Homes and Castlerock Builders. Drinks and concessions also will be available. 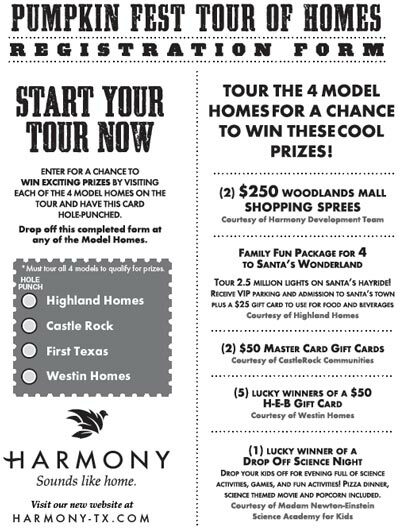 Harmony is the newest community of Johnson Development Corp., a Houston-based, award-winning residential development company. Its impressive collection of Houston-area communities includes Woodforest, Sienna Plantation, Riverstone, Imperial Sugar Land, Cross Creek Ranch, Willow Creek Farms, Fall Creek, Tuscan Lakes, Edgewater and Silverlake. In addition to hosting events such as the Pumpkin Fest & Tour of Homes, Johnson Development is investing in a new aquatics complex, scheduled to open in next summer, enhanced landscaping and several neighborhood parks within the community.